I think Mavs can agree to trade a first, but it will just happen 2 years after ATL gets theirs. Hmmm HB is the only guy left who could maybe net a first? The Mavs are reportedly working to get a first-round pick to give the Knicks, per Wojnarowski and ESPN. Their protected first-round pick is now the Atlanta Hawks’ after a trade for Luka Doncic. Last edited by BPo001; 01-31-2019 at 04:32 PM. Jordan most likely may get traded again or release as knicks are in tank mode if so i bring jordan back to mavs. Luka KP together are lethal. Hardaway is a gunner thats gonna drive rick crazy and lee been benched the entire yr but healthy and upgrade. Since we are picking up THJ at 18 and CL at 12.8 for almost 31 million, i don't see us adding another big name this off season. 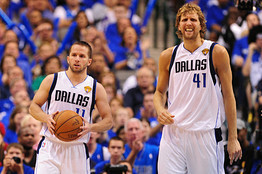 We are pretty much done in FA through next year but we have two young super stars so it's still a win for the Mavs. NY fans have to be screaming right now. LOL I can't wait to see Stephen A Smith's reaction. I know this QO thing sounds bad, but it's not like a Nerlens situation. It's great for us to evaluate KP on a cheap deal and then be in the driver's seat to resign him. Currently, I don't know why he would want to screw the Mavs over. It's one of the teams he was OK with being traded to. I'd love to unload Barnes for an expiring or a younger, cheaper player. Unlikely, but who knows. Skin said something about him signing the QO and that gives him a cap hold. We can then sign other FA and go over the cap to resign KP. I want details, this could be huge. Last edited by Underdog; 01-31-2019 at 04:37 PM. a theory: Leveraging he'll do this so they dont low ball him off inj, which they probably would. I think this makes a lot of sense. I don't see any reason why we shouldn't offer him his five-year max. I think THJ is overpaid but a pretty good player that kind of had to be a chucker in NY. In Dallas he could be much better with Luka and just feeding off him. I doubt this will happen, but Jordan's free after this year. Does he come back? Would we want him? Unless there are any more trades, we will have a big expiring contracts next year in HB (25.1) THJ (18.1) CL (12.7) and DP (10.2) for $66.1 million. That's either a lot of salary cap to play with after a full year of KP and Luka, or final year players to trade during the season. We are looking really good either way. Dennis Smith will be a decent to good starting pg in the NBA. He needs touches and full control, which is what he will have in N.Y. He wasn't helping this team in the slightest. When you take the ball out of your best players (Doncic) hands it's never a good thing. Best of luck to him. Wes was killing this team. Don't be surprised if he gets bought out. Good riddance. I personally will miss Deandre Jordan. He had fun out there and did a pretty good job imo. The mavs weren't constantly getting pounded with 2, 3, 4 offensive rebounds at a time like they were last year. He was a good passer too. Free throw shooting was not an issue anymore. Yes he was slow to help on a lot of plays but I'm chalking that up to not having the footspeed and or stamina to do it at this point. He has lost a step for sure. Yeah we need a center again and will have rebounding issues. Also our backup PG is now Brunson? Donnie is 100% executive of the year. Can’t believe the Knicks couldn’t get more. Devin Harris as well for back up PG. This is beyond huge... I'm extremely pumped. With KP and Luka, the Mavs are going to be extremely attractive to any free agent. I do personally. He's a top 15 center. At the right price why wouldn't you? Anyone checked in on Knicks fans? I mean they have the cap space to sign players buttttt we know how thats worked before. Theyre closer to Zion than we are though. They took Frank over Dennis, then ended up trading Porzingis to fix their mistake... It would be hilarious if the lotto balls conspired against them and no FAs ended up signing there... Or watch them sign Kyrie and end up putting DSJ right back into the same position he was in with Luka. Last edited by Underdog; 01-31-2019 at 04:53 PM. I absolutely want him back. And I hope Luka makes that known to front office. They formed a legit bond in a short amount of time. The Mavs have never had two franchise players AND cap space. When they had Dirk in his prime, they never had cap space...not at any point. Hell, they've probably never had one young franchise player and cap space... this is amazing. Last edited by Skywalker; 01-31-2019 at 04:56 PM. Luka & Porzingis is gonna make a lot of big name FAs take pause and consider their destination this summer... Like, do the Knicks still appeal to Durant at this point? If the Lakers land AD, then we could very well be one of the best options available. Luka/Durant/Porzingis is an instant contender. Last edited by Underdog; 01-31-2019 at 04:56 PM. If I'm not mistaken players are not able to go back to the team that traded them for a full calendar year after the trade. So I don't think we'd be able to bring back DAJ even if we wanted to. Last edited by thewizard; 01-31-2019 at 04:58 PM. And selfishly (for me), I think this increases the chances that Dirk comes back IF he is healthy and feels that he can help the team. You can always use another shooter off the bench. So who starts the Dennis Smith Jr. appreciation thread? Doesn't that change if he's bought out/waived, though? Or traded again? We traded Devin at the deadline last year and signed him five months later in free agency. My bad. You may be right. I just remember the NBA changing something about players resigning to the team that trades them at some point. I really don't know the specifics of the CBA in this case. I *think* that applies when you trade a player, they get bought out, they then can not resign with the original team. I think Stackhouse made comments years ago that if he was traded and bought out he was going to come right back. Goodness. This just set us up for YEARSSSSSS! A clear night in big D. Thousands of fans ready...anxiously awaiting his arrival.